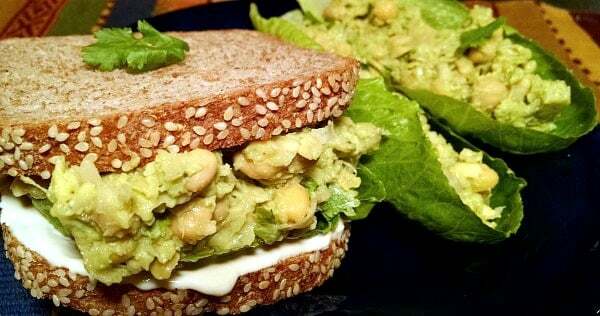 Chickpea Vegan Salad with avocado is by far my favorite vegan sandwich of all time. Something about the flavors of lime, avocado, and cilantro just thrill my taste buds. Checkout our cooking demo video to see how simple this recipe is to make. There are so many options for serving this spread–vegan sandwiches, wraps, or even lettuce wraps. We sometimes stuff endive or other large lettuce leaves with this spread and serve as an appetizer. 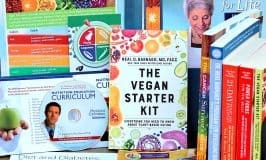 It’s a great option for those avoiding bread and gluten products. 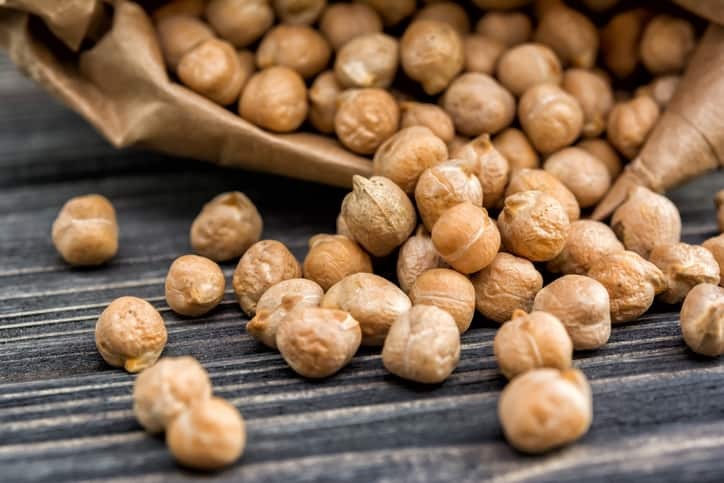 This chickpea vegan salad is delicious on bread or in a wrap. Every summer, we spend as much time at North Carolina and South Carolina lakes as possible. We enjoy boating, swimming, exploring water falls, and having picnics. 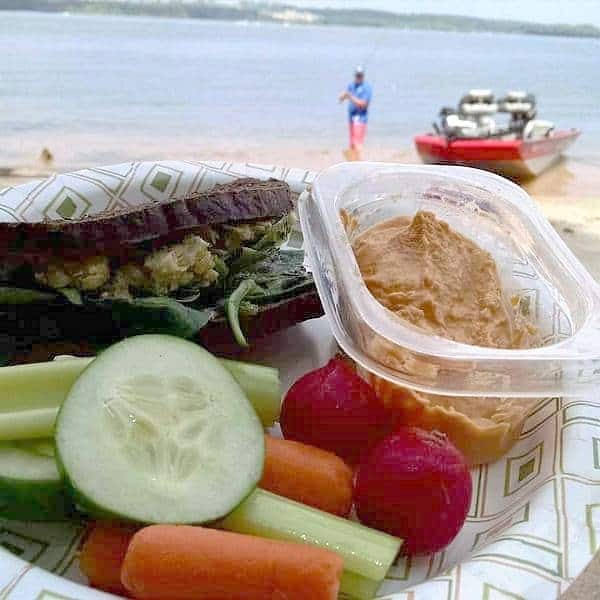 Being out on the water and sandy beaches requires that lunches be simple with foods that can be kept on ice and not require heating. Our cooler is always packed with vegan sandwiches, Roasted Red Pepper Hummus with fresh vegetables, and fresh fruit like mangoes and pears. It is all about keeping it simple and delicious. 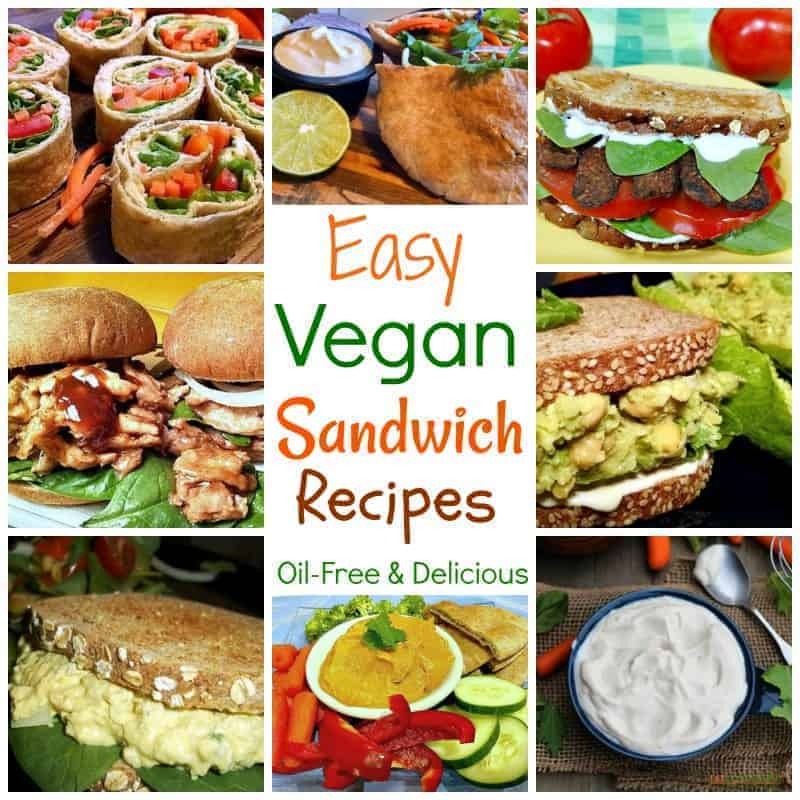 With these Smashed Chickpea Avocado Vegan Sandwiches we get both! Perfect picnic and lakeside recipes! When we take picnic lunches anywhere, these are definitely going with us! If you want to make this ahead of time and have it still keep its pretty green color, there’s a trick for that. I have had a lot of luck keeping it from turning too dark by placing the avocado pit in an airtight bowl with the spread and storing in the refrigerator. It will keep longer that way. I made this the other day, but put it inside a tortilla with some spinach. Hubby and I loved it! 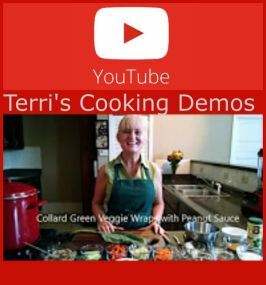 Thank you!–Bonnie L.
Watch the cooking demonstration at the bottom of the recipe to see how easy preparing this recipe can be! This recipe has many variations from some terrific chefs. 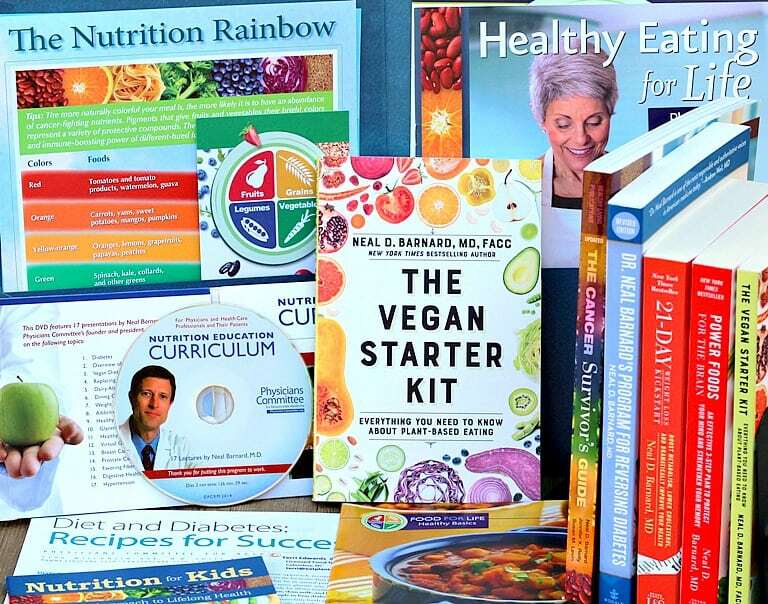 The first time I ever saw it was from cookbook author, Collen Patrick-Goudreau. Tired? Don't feel like cooking? 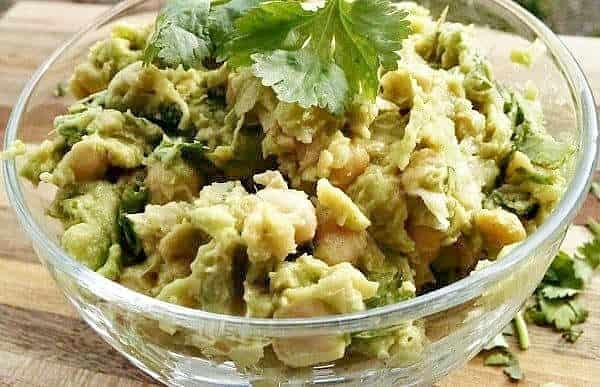 This chickpea vegan salad with avocado takes less than 10 minutes and only requires a bowl and fork to prepare. No kidding! Protein-packed and delicious! 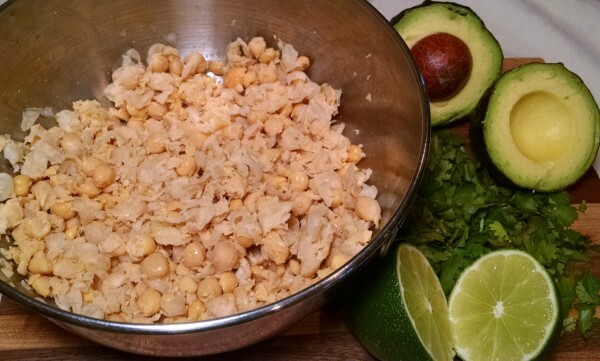 In a medium bowl, using a fork or potato masher, smash the chickpeas and avocado together. Add in cilantro, green onion, and lime juice. Season with salt and pepper, to taste. Spread salad on bread and top with your favorite sandwich toppings. I like to add fresh spinach leaves. Or you can stuff the spread into an endive or other lettuce leaf and serve for a beautiful and delicious appetizer! Note: This salad also makes a great dip. Serve with cut up veggies, crackers, or pita chips. Best eaten the day it is made because it will turn brown due to the avocado. 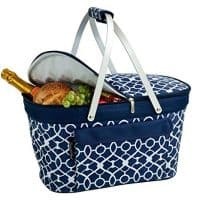 Great for picnics and quick lunches! Do you have fat free, oil free, Whole wheat flour Pizza dough recipe? I made this the other day, but put it inside a tortilla with some spinach. Hubby and I loved it! Thank you! Everything tastes good on a tortilla! Great idea! 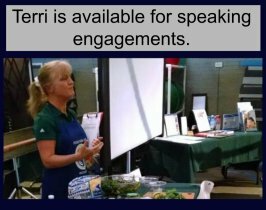 Hi Terri – sound uber yummy. Going to try that this weekend! But, I have a question. I’m not very good with herbs and spices (knowing what to do), and I need to substitute out for the cilantro. I’m one of those people with the weird system where cilantro tastes like soap, so I don’t use it. What might you suggest as a substitute? Thanks! Hi Laura–I would think fresh mint could be a good substitute. I love the flavor of mint and think it might be a good compliment, in place of the cilantro. I’d love to hear how it turns out. Good luck! Hi- are there any substitutes for the avocado? 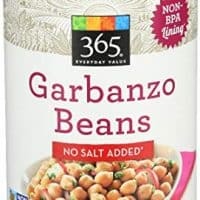 I dont like them and was wondering if you ever mash anything else in with the chickpeas as an alternative? Sarah, though I haven’t tried it myself, others have used green peas as a substitute for avocado. Definitely worth a try, and please let me know how it turns out for you. I made this and added some mild banana pepper rings to my sandwich. So good! Just made this and put it inside of spelt tortillas. Super yummy! Thanks!! I am one of those who is not a cilantro fan. I sometimes season a chickpea/avocado blend with either a dash of curry powder or a bit of cumin & chili powder. Both versions are very tasty! You can add fresh basil and Dijon mustard to this recipe. Those sound like great additions to me! Made this with some substitutes. Didn’t have an avocado so I used Wholly Guacamole from Costco: https://www.eatwholly.com/products/ and added one finely chopped de-seeded jalapeno pepper. Didn’t have green onion so I added some finely chopped red onion. No cilantro so I used some coriander. And, I added a touch of garlic powder. VERY tasty, enjoyed with some whole grain tortilla chips and fresh organic salsa. Thanks for a great recipe. My ten year old daughter and I just had this and found it delicious! I would make it with flat leaf parsley for someone who doesn’t like fresh coriander/cilantro. Parsley in substitution for cilantro is an excellent suggestion. So glad that you and your daughter loved this! This is one of my favorite go-to recipes!!! Looked beautiful with toasted bread on a platter at a get-together with friends for game night (everyone wanted to try them) and NO ONE was disappointed!!! 😃 DELICIOUS!!!! So good! I substituted red for green onion, some dried cilantro instead of fresh, dash of garlic powder. Plan to try with peas next time. Thank you! Wonderful! Thanks so much for letting us know how you liked it!